Amazon cut prices at Whole Foods Market on Monday as it completed its acquisition of the high-end grocer. That’s just the first chapter in its playbook as it doubles down on groceries, analysts say. Amazon.com sells refrigerators, socks, power drills and books from its perch at the top of online commerce. But it doesn’t sell much produce. The Seattle company’s expensive effort to change that started Monday. 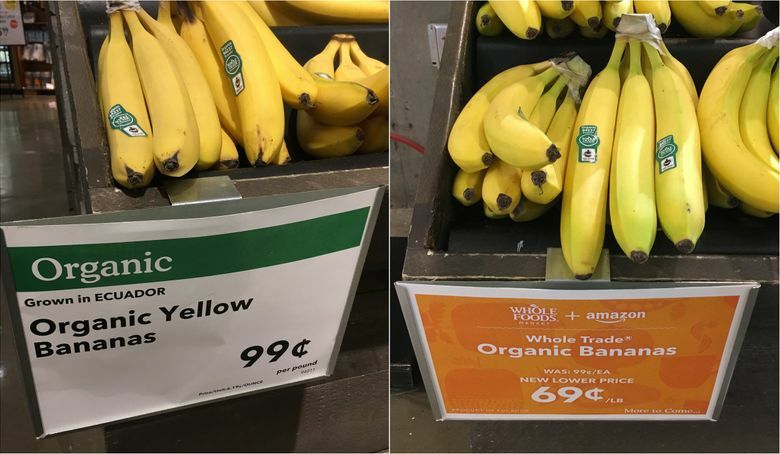 Amazon reintroduced itself to the grocery-shopping public with 69-cent organic bananas among other price cuts at Whole Foods Market on the day it completed the $13.7 billion takeover of the high-end grocer. Slashing prices on popular items is nothing new for the grocery industry. Supermarket chains have long kept prices of select staples low to draw people into their stores, banking that the discounts would pay off as increased foot traffic sends other items flying off shelves. That’s a playbook Amazon itself has used in the digital realm as it expanded from book sales to clothing, appliances and electronics. Amazon, which says it aims to match in its online store the lowest price offered by competitors, has long put a priority on gaining new customers over immediate profits. Analysts expect much of the same as Amazon doubles down on groceries. There’s plenty of cutting to be done at Whole Foods. The chain, sometimes called “Whole Paycheck” for its high prices, has profit margins higher than the average grocer. Before the acquisition, Whole Foods had projected that it was on track to post a profit of $409 million this year and $470 million in 2018. Analysts with Morgan Stanley estimate that Amazon could cut Whole Foods prices by 4 percent to 8 percent and still break even. An Amazon spokeswoman declined to comment on the company’s plans for Whole Foods pricing. The company has spent more than a decade experimenting with the delivery of food items ordered online — with AmazonFresh and, more recently, drive-through pickup locations — with little to show for it. Those efforts account for less than 1 percent of U.S. grocery-store sales. Just 25 percent of U.S. adults have ever shopped for foodstuffs on Amazon, according to a survey by investment bank UBS, the smallest percentage for any major category of consumer goods sold by the online retail giant. Visitors to the Whole Foods in the South Lake Union neighborhood, at the heart of Amazon’s sprawling Seattle footprint, were greeted on Monday with outdoor banners that combined the companies’ two logos: “Whole Foods + Amazon.” An Amazon film crew was on hand in the morning to document the changeover, interviewing shoppers and capturing the scene. Inside, price cuts that Amazon promised last week arrived, ranging from 10 percent on organic butter to 33 percent on organic Gala apples. Among the shoppers were Kate Gomberg and Rick Borestky. The Vancouver, B.C., couple, in town to drop off their son at an internship at Amazon, said they’re not regular Whole Foods customers but say they might consider it now. “It seems to be a good thing if the prices are coming down,” Gomberg said. Chris McCabe, a former Amazon employee who leads a consultancy advising sellers who use Amazon, said the company’s pattern in entering new markets is clear: price cuts, followed by the integration of shoppers into the other services in Amazon’s empire. Amazon has hinted at those steps, promising discounts to Whole Foods shoppers who enroll in its $99-a-year Amazon Prime membership program and, down the line, customer pickup of online orders from lockers at Whole Foods stores. Other grocers are keeping an eye on their reshaped competitor. Kroger, the owner of QFC and Fred Meyer, stressed in an emailed statement Monday its “unending commitment to lower prices.” Shares of the giant grocery chain have slumped 28 percent since Amazon announced it would buy Whole Foods. A spokeswoman for PCC Natural Markets, whose CEO had previously said she wasn’t worried about the combination, said the Seattle-based natural foods co-op would continue to keep an eye on competitors’ pricing. Still, Metropolitan Market started working with Instacart about two weeks ago to offer grocery delivery. 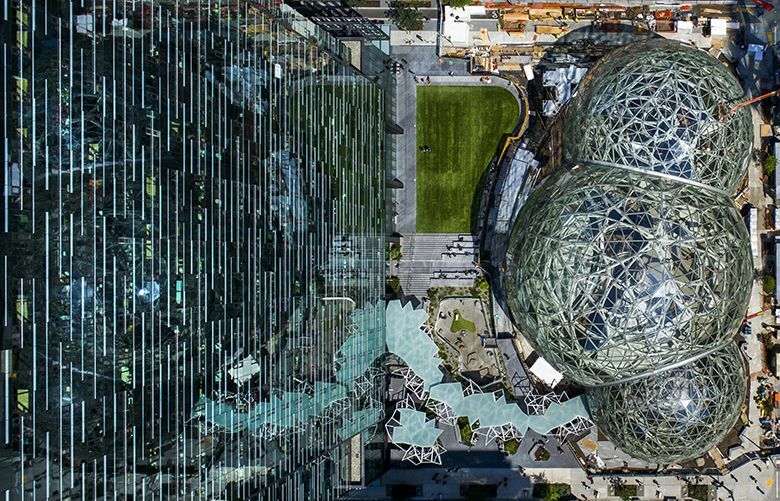 McMillanDoolittle’s Stern said it’s Amazon’s potential steps down the line that probably worry competitors more than Monday’s price cuts.